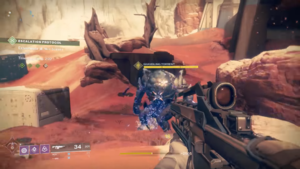 Shambling Torrents are an Ultra Ogre variant that serves as the boss of the first and fourth levels of the Escalation Protocol World Event. It is a devastating enemy to most Guardians as said from its name and, like the others, will try to sabotage the Warmind, Rasputin. Killing the Ogre will ultimately result in the Guardians to move on to the next level. The Shambling Torrent is the final part of level one and the final boss of the level. The players will only be granted 1-2 minutes to destroy it or else they'll fail the public event. Although the size of a regular Ogre and bares the same abilities, it has a massive health pool, matching or even surpassing the health pool of a Raid Ultra. To be able to withstand and defeat the monster, players will need to be the power level of at least 350 will multiple other people of at least 2 by there sides, along with them utilizing the powers of the Valkyrie and Swords from the Severing Knights. Powerful weapons including the Sleeper Simulant, The Wardcliff Coil, and the Tractor Cannon will be highly recommended. The Shambling Torrents are the only Ogre Ultras of a Public Event that requires 370 Light at least as said in the death screen.